"There's politics, and then there's taking care of yourself and your family," said analyst Chris Sloan of the consulting firm Avalere Health. "You can have political views about a program like the Affordable Care Act, but when you get an opportunity to get subsidized health insurance for you and your family ... politics is a distant consideration." AP's analysis found that 11 states beat 2017′s enrollment figures. Of them, eight —Iowa, Kansas, Kentucky, Missouri, Nebraska, North Dakota, South Dakota and Wyoming— went for Trump, who posted double-digit victories in all but Iowa. Graphic shows percentage of sign-ups in states using HealthCare.gov compared to those in 2017. To be sure, Trump states are also home to many people who voted for Democrat Hillary Clinton. But the AP's analysis points to a pattern of benefits from the health law in states the president won. The premium dollars have economic ripple effects, reimbursing hospitals and doctors for services that might otherwise have gone unpaid and written off as bad debt. Also, people with health insurance are better able to manage chronic medical problems, remaining productive, tax-paying members of society. Such economic and political realities will be in the background when Congress returns in January to another installment of the nation's long-running debate over health care. Republicans and Democrats seem to have battled to a draw for now. The year 2019 — the effective date for repeal of the ACA's requirement that most people have coverage — is looking like a time of reckoning for the law's insurance markets, which offer subsidized private plans to people who don't have job-based coverage. Unexpectedly strong enrollment numbers announced this week for the 39 states served by the federal HealthCare.gov website testify to consumer demand for the program and its guarantee that people with medical problems can't be turned away. Yet those numbers still lag behind last season's sign-up total. It's unclear what the final count for next year will be. 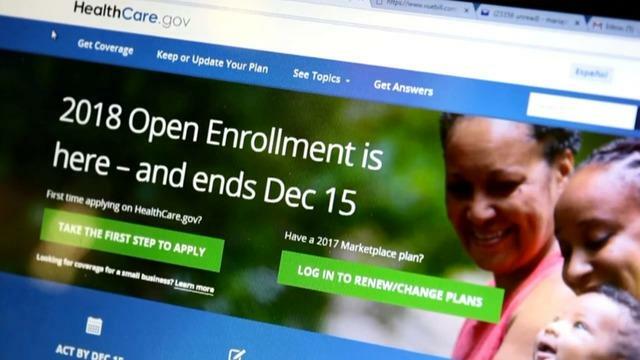 HealthCare.gov numbers released Thursday are incomplete, and some states running their own insurance websites will continue enrolling people throughout January. Separately, actions by the Trump administration and the GOP-led Congress are creating incentives for healthy people to stay out of the health law's insurance markets. Starting in 2019, people won't have to worry about incurring a fine from the IRS for being uninsured, because the tax overhaul repeals that mandate. At the same time, the administration is taking regulatory action to open a path for the sale of low-cost insurance plans that don't provide the health law's benefits or guarantees. "The real worry for me is what the health plans do," said Sloan. "If they decide that without the mandate it's not worth staying in this market, you could end up with swaths of the country having no insurers." On Friday, Trump said he thinks repealing the mandate as part of the tax overhaul "ultimately leads to the end of Obamacare." The president continued to ignore other parts of the law that remain untouched by the tax bill, including its Medicaid expansion benefiting low-income adults and the popular protections for people with pre-existing conditions. Former President Barack Obama's law "is more durable and important to Americans in terms of getting affordable health insurance than even its advocates expected," said John McDonough, a professor at the Harvard T.H. Chan School of Public Health, who served as an adviser to Senate Democrats during the ACA debate more than seven years ago. "With the end of the attempts to bring it down and to repeal it, perhaps there will be opportunities in the near future to try to actually build up and improve it, because it could use some work," he added.